When I was in middle school my grandmother gave me a sweatshirt that read: “God created man before woman, but then you always create a rough draft before you create a masterpiece.” It was a funny one-liner, and at that time in my life when the differences between boys and girls were becoming more and more pronounced and when they were starting to notice those differences, this sweatshirt quickly became my favorite. I wasn’t your average twelve-year-old girl. 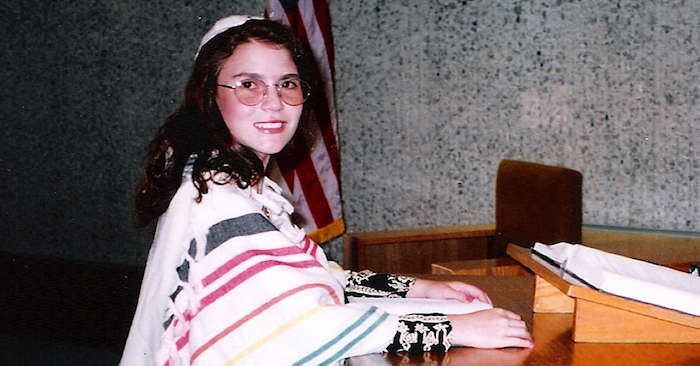 I craved religion and a leadership role in the synagogue. But in my home congregation, women were not counted in a minyan or allowed to lead any service other than Kabbalat Shabbat or Psukei d’zimra. Many women didn’t wear tallitot, and I’d never seen any wear tefillin. But at twelve years old, I wanted it all. I begged to lead as much of the service as they’d allow, and my mind was made up that I was going to wear tefillin. I don’t know what it was about those little black boxes with leather straps, but I was drawn to them. The boys and the other girls made fun of me because of it. The older men in the congregation thought it was wrong. Many of them stared. I didn’t care; I absolutely loved putting on my tefillin in the morning. I chose the mitzvah, and I didn’t care what anybody else thought. Looking back on that experience, I know in my heart that my attachment came partly from being raised in a family that loved being Jewish and partly from my ability to choose to take on this responsibility. Our parshah this week, parshat Yitro, continues the narrative of Moshe as the new leader of a newly freed nation of Israel. After generations of slavery, the freedom of choice was not a familiar concept. And as the people were learning to discover freedom, Moshe learned every day what it meant to be a leader. Even Moses, the great leader of the Israelites, didn’t really choose that title. He insisted that he was the wrong person for the job, and God would hear none of it. We see Moses the leader struggling to find the passion in doing something he’s been told to do. It can be difficult to love a job if you aren’t free to choose whether or not you want to do it. It happens all the time with adults and children. A student will write beautiful poetry . . . right up until poetry becomes an assignment, and the student shuts down. I hated carrots growing up, but I was required to eat my carrots at dinner. Years later, when no one was waiting for me to finish the vegetables on my plate, I actually found that I didn’t hate carrots at all. I just hated being told to eat them. In parshat Yitro, God utters ten phrases that are often viewed as the be all and end all, ten demands and obligations upon us as Jews. But I believe that each one presents us with a choice. These utterances give us the choice to decide how we will act. Some come with explicit consequences attached, others leave it up to the individual to understand, but each one presents an opportunity. “I am the Lord your God.” Right at the start we are given the choice to believe and move forward on this Jewish path or walk away from faith. “Have no other Gods but me, and make no images.” Here we learn that apparently less is more, and the choice is ours to unbind ourselves from the physical and give meaning to the spiritual. “Do not use the name of God in vain.” Choose your words wisely and make each one count. “Remember Shabbat and make it holy.” You are in control of how you use your time. If you choose Shabbat, that holiness becomes a weekly part of life. “Honor your father and mother.” Choose to keep family and loved ones close or choose a life of solitude. “Do not murder.” Choose to sustain and maintain life. “Do not commit adultery.” As we tell children, choose to keep your hands to yourself. “Do not steal.” Choose to consider what you take away from others and what you give to them. “Do not bear false witness against your neighbor.” Choose an honest life, do the right thing, and give others the benefit of the doubt. “Do not covet.” Choose to accept and appreciate what you have, and choose to find balance in the material and the spiritual. These mitzvot seem universal to us, so it’s odd to think of any of these ten having exemptions, but the world of Jewish responsibility is a tricky one. Some of our other mitzvot, like wearing tefillin six mornings a week, are time-bound obligations for men, while women are exempt. When I was twelve, I’m not sure I knew what “exempt” meant, but I knew I had a choice. I’ve been asked, “What’s it like to be a female rabbi?” or “What can you offer as a female rabbi that a male rabbi cannot?” Truthfully, I believe that each human being offers something that no other human can, regardless of gender. But when I stop to think about it, as a female rabbi – and a female Jew for that matter – I have a distinct advantage. Besides being able to build and bridge relationships from a new perspective and serve as a positive Jewish role model for both men and women, I have an enormous opportunity. I have choice. For me, the most powerful answer to the question of being a female rabbi comes from our parshah this week. At the beginning of Yitro, Moshe’s father in law asks Moshe about this Israelite religion, and then chooses to become a part of it. He chooses to join our people on their journey and chooses to accept the Ten Commandments and Jewish living not because he is obligated to, but because he wants to. As a female rabbi and as a Jewish woman, I have the unique advantage of approaching my Jewish prayer, ritual, and life from the perspective of choice. I put on my tallit and tefillin not only because the text tells me to or because someone made me or even asked me to. I put them on because I want to, because I was able to explore their meaning and find my own connection. When I put on my tallit and tefillin, it is out of a passionate love for the traditions that bind me to my past, to God, and to the Jewish people. Watching the younger children in services is heartwarming. They love tefillot, they are excited about the prayers, especially when they finally learn that one that they’ve been struggling with. You see, no one has told them yet that in just a few years they’ll be obligated to pray. When the students become b’nai mitzvah age, suddenly Judaism becomes a chore. Someone’s telling me I have to do this, therefore it must not be fun. Living a Jewish life, especially when you’re in middle school, is often presented as a have to, a must, and not a choice. When we explain to teenagers the obligations we expect of them, sometimes the message we’re really sending is “It’s a good thing we’re making you do this, otherwise you wouldn’t want to.” For example, when we end the discussion of kashrut by simply saying that we keep these laws because God said so, we lose a precious opportunity to explain that we observe because we are asked to, but also because it fills every day with the recognition that we are a part of something bigger. Choice is a pretty powerful thing. And if we can empower each other with the idea of living Jewish tradition by choice, regardless of age or gender, together we’re creating a masterpiece. Think about the last time you watched your favorite movie. You’ve probably seen it 100 times, yet each time you watch it you find something new to enjoy like foreshadowing that wasn’t obvious before or minute aspects of an intimate relationship that were easy to overlook. Your experience and love of the movie isn’t diminished because you’ve seen it again and again; it’s enriched. In the school world, at a certain point students realize that review is a part of the necessary work during the year. At the beginning of the year, review is especially helpful to get the brain turned back on to learning and to help the students draw upon information they previously learned. Later in the year, it’s helpful for students to look back and see what they’ve learned. Review, the process of going over something again and again, also serves a deeper purpose. This week we read parshat Yitro, perhaps one of the most famous portions in the entire Torah. The central piece of the portion is the giving of the Ten Commandments by God to Moshe and the people Israel. We now have a set of laws to live by, a guide towards being a people outside of slavery. But, before the Torah instructs us in these laws, it reminds us of the family relationship Moshe has with his father-in-law and how he sets up a legal system. In chapter 19, verse 1, the Torah subtly reminds Moshe (and the modern reader) of the importance of being present. The text reads, “On the third day of the children of Israel’s going out from Egypt, on that day they came to the wilderness of Sinai.” The medieval commentator Rashi notices, on a closer read, that the text is redundant. Why does it give us the date and then say again, “on that day”? It would have been sufficient to just give either the date or say on that day. Rashi answers his question by teaching that the Torah uses this phraseology to remind us that this day was unique, and moreover, every day is unique. Rashi expands his comment to the Ten Commandments that come after this. We read the Commandments for the first time in this parshah, but read them again in Deuteronomy as the Torah narrative comes to an end. The Torah includes the Commandments twice because we read the words anew each time our brain processes them. Rashi explains that “on this day” means that each day, every day, is a day when we accept Torah, and each reading should be like we’re hearing it in a new way for a new time. Using this logic we learn that while we may read the Torah over and over again, it is always something new. While we might have to review our multiplication facts before moving on to other math functions, we know that taking the time to review it means solidifying the knowledge and making a new connection to it. Rashi asks us to view the Torah similarly to how we would a favorite book or movie. To read it over and over again is a way of renewing our covenant, our promise to follow through and to see our heritage with fresh eyes. Most importantly, parshat Yitro reminds us to truly see each day as an opportunity to learn something new, each experience, no matter how mundane or repetitive, as a worthwhile connection to knowing ourselves and our world deeper. I grew up watching “Saved by the Bell,” that classic afternoon sitcom featuring tanned California teens as they navigated those troublesome – and endlessly comical – teenage years. 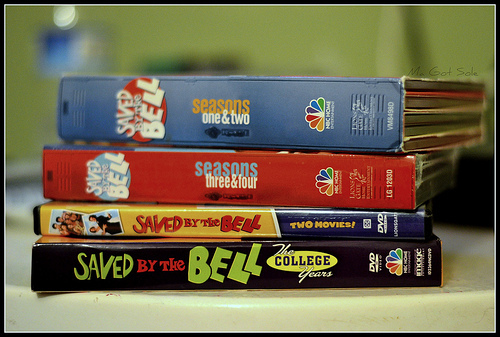 Ask any adult of my generation which episode comes to mind first, and the answer will likely be the episode in which Jessie, the perfect, straight A head of student council, feels overburdened by the pressure to get everything done. She becomes addicted to caffeine pills and has a nervous breakdown in which she professes “There’s no time, there’s never any time!” Jessie struggles with the familiar problem of having so much to do and no time to do it. I think this episode stuck with me all these years because it’s easy to relate to the out-of-control feeling that comes when there are overwhelming deadlines to meet. And we tend to punish ourselves by skipping a meal, staying home instead of going out with a friend, and just driving ourselves mad with frustration. We often get so caught up in the hustle and bustle of life, of wanting everything to get done, that we forget to take care of ourselves. Our parshah this week, Yitro, sends us this important reminder. We read about Moshe, the leader of the Israelite nation, struggling to do it all on his own. Just when Moshe appears to be dealing with – among other things – time management issues, God sends down the Ten Commandments. When God gives us the ten holy utterances, they serve as a blueprint for our own lives. They focus on balancing belief and spirituality with physical needs and relationships with our neighbors. Specifically, commandment number four reminds us of the importance of taking a break. Chapter 20, verses 8-11 instruct us to have Shabbat: “Remember the Shabbat day, to keep it holy. Six days you should work, and do all your work; but the seventh day is the Shabbat of God your God; in it you shall not do any work…” God commands us to take a break, and ends this commandment by teaching that even God, the all-powerful creator of the world, needed a break once a week. We are often striving for more: to do more, be more, learn more, but we forget to reflect on the cost of trying to pack our lives with wall-to-wall activity. It’s especially tough when we reach new stages in our lives to find the balance. As a first year rabbinical student, I struggled with getting all of my work done and getting good grades, along with staying on top of my personal life. I was pretty much a wreck until one of my teachers sat me down and taught me Rashi’s comment on the 6th commandment: everyone needs a day of rest. Rashi teaches us that the work we get done is the work we are meant to finish. If it isn’t done, then we weren’t meant to get there. Rashi urges us beyond our fear of losing control and asks us to recognize our imperfect mortality. Shabbat is a time not only to kindle Shabbos candles, but to rekindle the relationships, traditions, and connections that truly make us human. THIS TOO IS TORAH: Some people and communities support “commerce-free days” to encourage people to take a short break from shopping and digital life in order to recharge and refocus. Sounds a lot like Shabbat, doesn’t it? Teaching in the Middle School, I find myself trying, as I’m sure the parents do, to find the happy medium between micromanaging the students and their study habits (like requiring benders and study guides and giving extra time for projects) and letting the students manage their own time and studying schedule. If I micromanage, the students get the work done, but they also lose the responsibility for their own learning, homework and growth. If I let the students figure it out completely on their own, then I risk facing less than stellar quiz grades and assignments that are never turned in. It’s the same situation in the office place. By micromanaging we can become bogged down by the nitty gritty, but at least we’ll stay on top of the details. On the other hand, if we let the reigns go a little or delegate responsibility, we might find ourselves in a heap of trouble if something gets left behind. So we’re faced with a challenge: how do we find our happy medium? Moshe, the leader of the Israelites out from Egypt to the Promised Land, is also trying to learn this lesson. Parshat Yitro, our Torah portion for the week, introduces us to Moshe the workhorse, a workaholic who needs to be reacquainted with his family because he never sees them. While in thisparshah Moshe receives the Ten Commandments, he also learns an important life lesson about management of a community. Since God called on Moshe, he has been the sole leader of the people, dealing with the problems, disputes and needs of the Israelites on his own. The text describes Moshe as the judge of the people, with the people standing in line from morning until evening until Moshe can help them solve their disputes. When Yitro, Moshe’s father-in-law, asks Moshe what’s going on, Moshe simply tells him that he’s doing the job God asked him to do. Waiting in line all day long has become a way of life for the people because only Moshe can do the job of judge. I imagine we all have moments where we think, “If you want something done right . . .” You feel that no one else knows the intricacies of the job like you do. When you’re working on something close to your heart, you have a sense of ownership and protection over your work that does not allow you to think anyone else can do the job. But each time we take on a new task, that investment of time has to come from somewhere, whether it’s another five minutes we could be spending with family or much needed time to rest. When we’re in the thick of our work, we often lose sight of the big picture and need help regaining perspective. Moses learned that it’s impossible to be all things to all people. Leadership isn’t about always being the first to arrive and the last to go home. Rather, it’s about recognizing and capitalizing on the strengths in a community of people. That’s when the real work gets done. ללמוד To Learn: ללמד To Teach: Parshat Yitro contains within it the 10 Commandments, and the description of the fire, lightning and thunder that was part of the event. Chapter 19 of the book of Shemot reminds us that it is necessary to use our senses in order to be fully present in experiences. Read through chapter 19 together as a family and put yourself in the shoes of the Israelites at the mountain. As a family discuss how you feel? What you expect? What does this tell you about the importance of these mitzvot. לשמור To Keep: לעשות To Do: As a family, take a look at the 10 Commandments and discuss how each commandment can be kept and honored in your lives. Looking at the basic ideas presented in each commandment, come up with your own tablets and rules to live by that will help lead you to truly understand and embrace these 10 mitzvot. I am God, your God that brought you out from the land of Egypt from the house of slavery. You should not have other Gods before me. You should not make for yourself idols or images that are in the sky above or the earth below or in the water below the land. You will not bow down to them or worship them because I, God your God is a jealous God and remember the sins of the fathers on the children for 3rd and 4th generations of those who hate me. And I will do good to the 1000th generation of those who love me and guard my mitzvot. you will not lift up the name of God, your God in a lie because God will not forgive those who use God’s name as a lie. Remember the Shabbat day for it is holy. 6 days you will work and do all of your work. On the seventh day it is Shabbat for God your God, you will not do all work; you or your son or your daughter or your male servant or your female servant or your animal or the stranger that is in your gates. Because in 6 days God made the sky and the land, the sea and all that is in them and he rested on the 7th day therefore God blessed day 7 and made it holy. Honor your father and your mother so that your days will be lengthened on the land that God gave to you. You will not give false testimony about your neighbor. You will not covet the house of your friend, you will not covet the wife of your friend or his male servant or female servant, or his donkey or anything that belongs to your friend. It is in our nature to question why we must do what we have to do. If we do something nice we have to know what we will get in return or what the consequence will be if we do something not so nice. Educational philosophy encourages us to answer from a place of love and logic, and “because I said so” is neither of these two. The “Love and Logic” reasoning teaches that we should embrace our students, show them compassion and empathy, and greet their questions (and even misbehaviors) not from a place of anger but from a place of understanding. Most important in this system is that the consequence of an action must logically match the action. For instance, when I slammed my bedroom door one too many times as a child, my father simply removed the door from its hinges. I learned that lesson quickly. A positive reinforcement for an action like helping to put away the groceries might be the opportunity to pick the next flavor of ice cream for the household. The Torah also comes primarily from a place of love and logic. This week’s parshah, Parshat Yitro, is laden with Mitzvot and in particular, those 10 golden rules we learn to live by. The middle commandment serves as the transitional point from the first to the second group of declarations because it incorporates both religious and social dimensions. This commandment also employs the “love and logic” reasoning. Chapter 20, verse 12 teaches: “Honor your father and your mother, so that your days on the land that God has given to you will be lengthened.” Even though the text teaches doing this (honoring your father and mother) so that you will receive that (long life) our natural inclination to question forces us to ask why is long life is the appropriate reward for honoring one’s father and mother? “Because I said so” does not not quite suffice here. The commentary of Toldot Yitzchak from Rabbi Yitzchak Karo tackles this question. Rabbi Karo teaches: “All of the laws in the Torah can be matched action for action. But if this is true, then the text should have taught, ‘honor your father and your mother so you will be honored.’” It would make sense to have similar reasoning between action and consequence. What does living a long life have to do with honoring one’s parents, he asks. The answer is that one who has lived for a long period of time will be honored. In other words, the Torah teaches “honor your father and mother” with the reward of long life so that you will be old and honored as well. The answer here is not “because I said so,” but rather another one of our golden rules: do unto others as you would want others to do unto you. We are obligated to treat one another with love and logic because it is only logical that we learn from what we see, from how we are treated and from how we live. Long life comes as a reward for asking why, but also knowing when to stop; when to go with your gut and when to accept the answer of “because.” Think about how our world would be if we all employed love and logic, if our long lives were filled with honoring one another, just because. Our ‘ethical covenant’ speaks of holiness and truth. A core principal with each of these is acting with Emunah, faith. How can your family employ the faith of love and logic in your daily life? The Torah grants that long life is a reward, something good. What will you do with your “long life”?